"I use bioroids because I can wipe their memories or just blow their brains out when the job is done. No witnesses means no witnesses." Assets: a total of 3 damage with Contract Killer or Dedicated Response Team. Ice: a total of 3 damage with Flare and a total 4 damage with Checkpoint. Operations: a net 5 meat damage with Scorched Earth, 3 with Traffic Accident and with Punitive Counterstrike 2+ damage (likely 4 damage, possibly 7 damage if runner was unlucky enough to not win after stealing Government Takeover) depending on the agenda that was stolen. 5/3 agenda helps with agenda compression when constructing a deck and minimizes the likelihood the runner can access an agenda on a random access. Many meat-damage causing combos require tags or other conditions that can sometimes be difficult to line up. The Cleaners can certainly be a fun part of an overall flat-line deck strategy as 1-2 scored copies of can be nearly impossible for a runner to overcome. Thankfully since Weyland has a number of meat-damage inducing options making The Cleaners certainly worth considering in such cases. 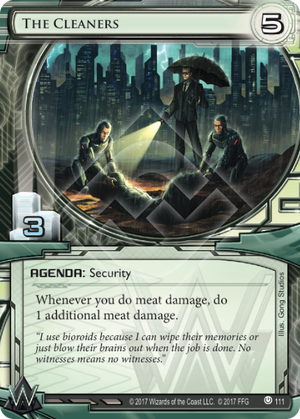 Weyland Consortium: Builder of Nations doubles its meat tax to 2 per turn usually - insane. Punitive Counterstrike gets another point of reach. Argus Security: Protection Guaranteed goes up to 3, though they can take a tag instead. Dedicated Response Team goes up to 3. Mr. Stone doubles to 2. Contract Killer - 2 to 3. Breached Dome doubles to 2, if you can spare the influence for minor one-off traps. There's others, but at the time of this writing none of them seem particularly useful in Weyland. Basically, it becomes much more likely that some combination of things will bring the runner into kill range. Cleaners do stack, but at that point you've probably won on points anyway. Nice card, glad they spared it from rotation.